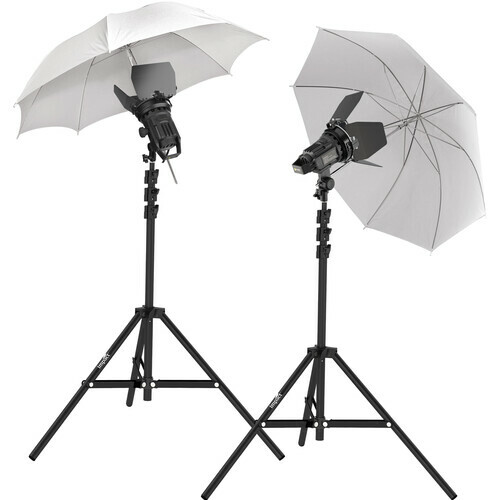 2 x White Translucent Umbrellas: 33"
B&H has put together this Angler Shadow Focus Spot 300 Focusing Flood Light Kit for image makers seeking a compact 2-light kit with focusing options. 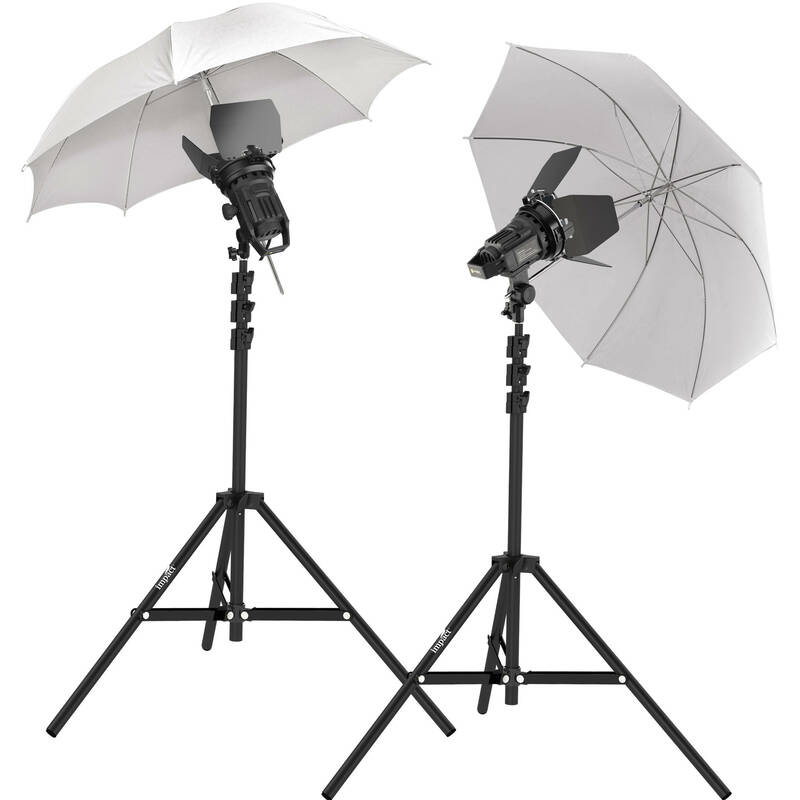 The kit includes two Shadow Focus Spot 300 fixtures with 4-way barndoors, a focusing range of 21 to 40 degrees, and two 8' air-cushioned light stands to support them. Two 33" white translucent umbrellas are also included to soften the output and widen the beam spread. Bulbs (300W) for the lights are purchased separately. The Angler Shadow Focus Spot 300 Focusing Flood Light is a 300W focusable fixture with a wide-angle 21-40° beam angle that's variable with a simple knob. The safety-glass-protected, separately purchased lamp has a color temperature of approximately 3100K with an average lamp life of 100 hours. Four-way barndoors are included to put the light where you want it and keep it off of areas that you don't. Convenience features include a cool-touch handle for safe tilting adjustments and a 12.5' power cable with an in-line switch and a grounded 3-prong US/North American plug. This Impact 33" White Translucent Umbrella is suggested for use in head-and-shoulders portraits for one or two persons. Box Dimensions (LxWxH) 10.55 x 8.4 x 7.45"
Box Dimensions (LxWxH) 21.55 x 3.7 x 1.6"